What brought this post about was the death of the final "Doolittle Raider" Colonel Cole joined the rest of his squadron. it was a sad day for us as a Nation. 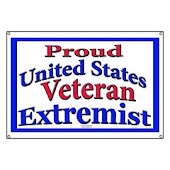 I had used the quote "Ordinary men stepped up and did Extraordinary things during Extraordinary times". I had posted this following post on a friends Facebook post., but I decided to repost it here. The Pics are compliments of "Sarge"
B25's strapped on deck, really good pic btw, and looks like there are a few SPD's mixed in with them. FDR wanted a "Morale Raid" to show that the Americans can strike back against the Japanese Juggernaut. After the litany of bad news from the war in the Pacific, from Pearl Harbor, the Battle of the Java Sea, the loss of the Prince of Wales and Repulse, the surrender of Singapore. The fear that the American public of invasion was real. FDR had the American government intern all the people of Japanese ancestry. But in retrospect, it probably saved the lives of some of them because the fear was so real, reprisals were possible. The raid effect was all out of proportion to its actual damage caused. Yes a bomb did hit a Japanese light carrier the Ryuho, but if the ship was to be used in the battle of the coral sea I don't know. The effect on the Japanese psyche can't be measured. Until the attack in April of 1942, Japan has never been attacked by a foreign power, it totally rattled the Japanese and raised doubts about the direction of the war. It also greenlighted Admiral Yamamoto's plan to attack Midway and the Aleutians. The general staff comprised of both Army and Navy and they had to come to a consensus on the future prosecution of the war effort against the Americans. The General Staff had different priorities, the Navy viewed the Americans as the main threat, whereas the Japanese Army viewed the Russians as the main threat. The attack broke the deadlock on the General Staff and they gave Admiral Yamamoto approval for the Midway operation upon the completion of the Port Moresby operation which turned into the battle of the Coral Sea. Admiral Yamamoto continued with his "Operation MI" to catch the American carriers at sea and destroy them which would force the Americans to sue for peace leaving the Japanese with the land and resources that they captured. Then the "Greater East Asia Co-Prosperity sphere" would have been a reality. Instead the Americans surprised the Japanese with better intelligence and luck, and defeated the Japanese with 4 first line carriers sunk along with the myth of Japanese invincibility. 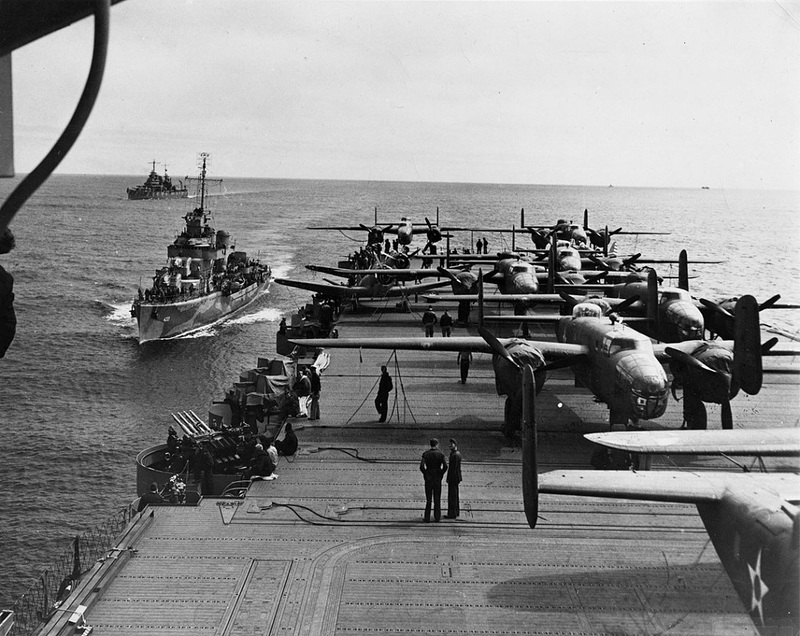 The Doolittle Raid set the pins in motion that eventually defeated the Japanese, but it took about 3.5 years to do it. From left: Lt. Henry Potter, navigator; Lt. Col. James Doolittle, pilot; Staff Sgt. Fred Braemer, bombardier; Lt. Richard Cole, co-pilot; and Staff Sgt. Paul Leonard, engineer/gunner. That being said, what those men did can't be discounted. 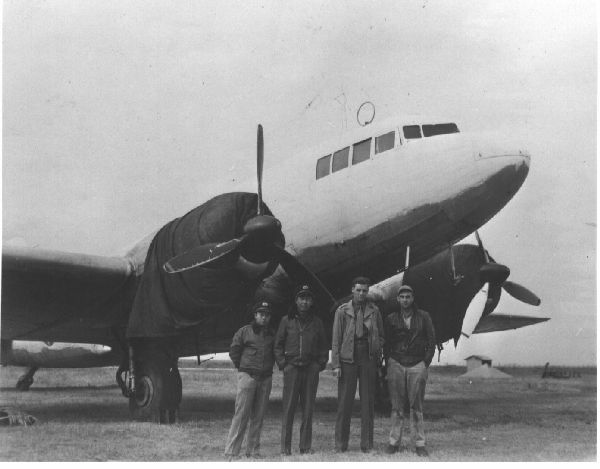 They volunteered for a mission with a high risk factor going up against a nation that has defeated us several times already and they were willing to fly a medium bomber off a pitching carrier in the Pacific ocean, bomb a nation at the height of their power and then go for landing in China after overflying the huge alerted Japanese army in China. 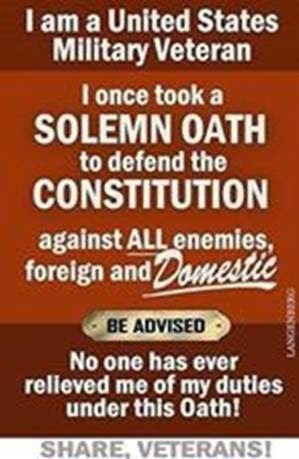 It took huge brass ones to do what they did. They inspired us when we needed it most. It brought hope to a battered nation. We are lessened by their passing. I asked my Dad about the article since he was an MP his first tour and "El CID" his second tour and he knows a lot about the subject. I did ask him if "Hashish" was a problem in Vietnam and he stated, "No, that was a European Troop problem" and I recall my friends that were in the Army in the early 80's in Germany "Doing a bowl". My Dad did tell me that the biggest source of "hashish" was through Amsterdam from Lebanon. Afganistan, and Turkey. The color told where it came from 99% of the time, Black was Afgan or Turkey, Light brown or reddish was Lebenon, the color came from how it was processed. It also was brought through France and smuggled down on the Rhine and Mosel River boats. I never saw a drug problem in my unit, partially because of what we were, drug use wasn't our thing. We got drug tested a lot because of our job. ....Booze was different though. We would buy a few racks of beer for the weekend. 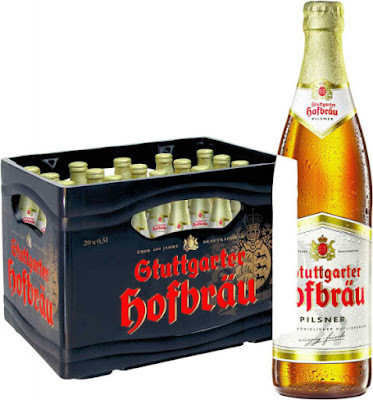 The Germans thought we were heathens because we like the beer cold whereas the Germans would drink it warm. The widespread use of drugs by soldiers in the Vietnam War was a hotly debated subject at the time. Even today there are different opinions. Was the problem exaggerated for political reasons? Or was it denied and under-reported for the same reasons? 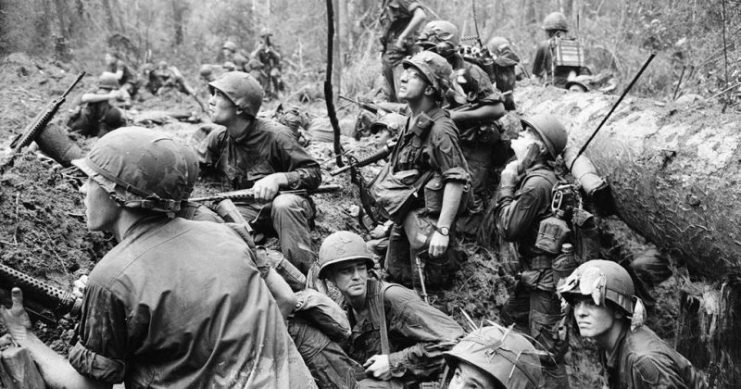 The two decades of the Vietnam War constituted a unique period in modern American history. 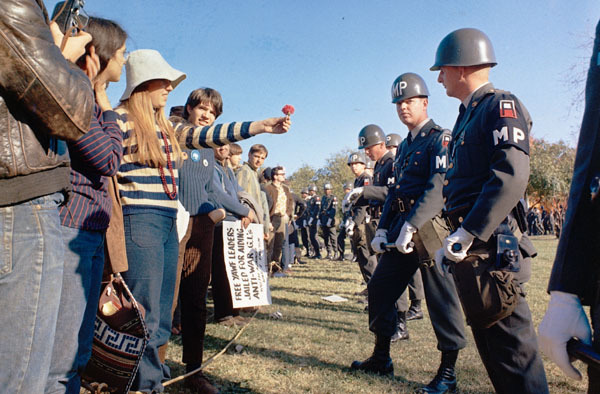 Drugs were very much part of the counterculture; another part was the music of the time which included many anti-war protest songs. There have been suggestions that not only was the use of both prescription and recreational drugs widespread but that this also played a significant role in the brutality that was witnessed against the people of Vietnam. 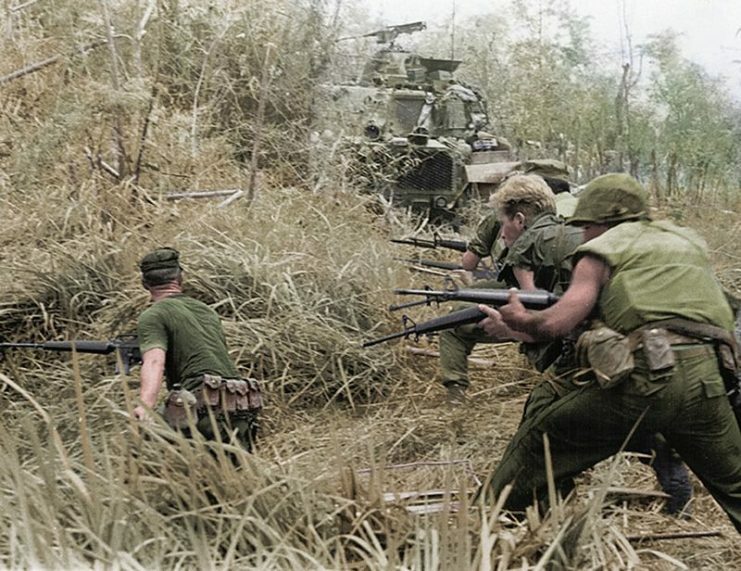 U.S. Marines with Company G, 2d Battalion, 7th Marines, direct a concentration of fire at the enemy during Operation Allen Brook, 8 May 1968. Since ancient times, drugs have been used by soldiers in battle. Sometimes these were taken to provide courage, increase endurance and stamina, or deal with fear and stress. The Vietnam War was no different in that respect. However, what did make the Vietnam situation different was the scale and availability of drugs. 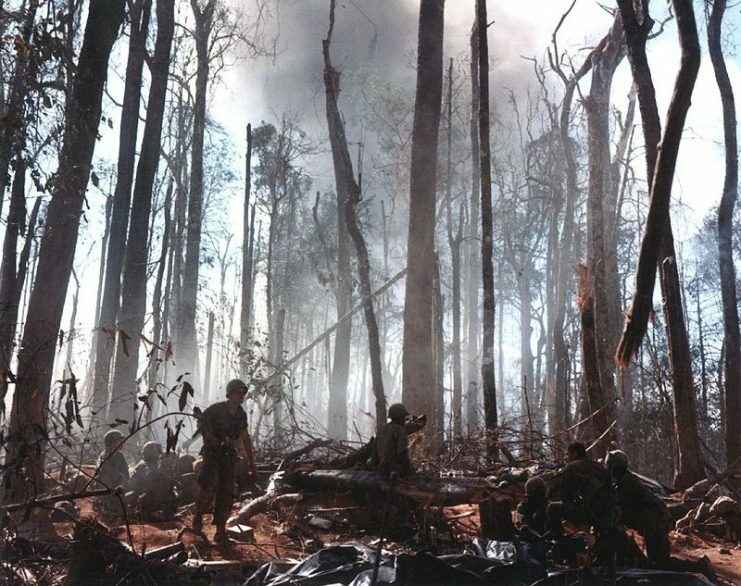 American infantrymen crowd into a mud-filled bomb crater and look up at tall jungle trees seeking out Viet Cong snipers firing at them during a battle in Phuoc Vinh, north-Northeast of Saigon in Vietnam’s War Zone D.
Although the Vietnam War lasted for 20 years from 1955 – 1975, things intensified towards the end of the 1960s. Spending on arms increased significantly as did the number of troops being deployed. At the same time, there was a general increase in the availability and use of recreational drugs in America. Research on drug use among soldiers suggests that it was common across a wide variety of substances. It was reported that 51% of GIs had taken marijuana while 31% had tried psychedelic drugs such as LSD and 28% had used hard drugs including heroin and cocaine. 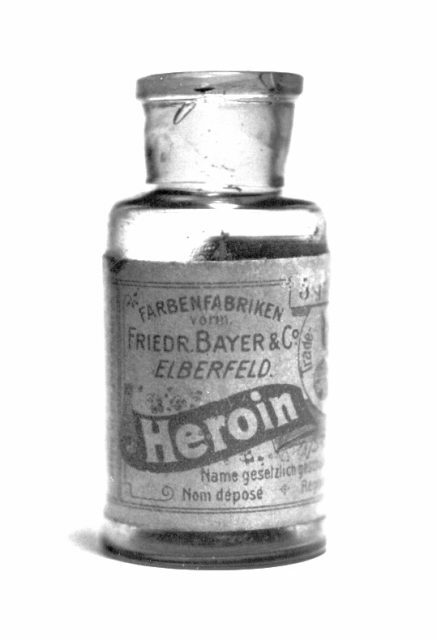 Bayer heroin bottle, originally containing 5 grams of Heroin substance. The label on the back references the 1924 US ban, and has a batch number stamp starting with 27, so it probably dates from the 1920’s. To some extent, the use of recreational drugs by soldiers was overlooked; it was even tolerated, informally at least. This seemed to be the case especially with the use of marijuana which could be acquired easily and cheaply from the local villagers. All soldiers needed were a few packets of American cigarettes which could be traded for a drug that would have cost them a considerable amount of money at home. 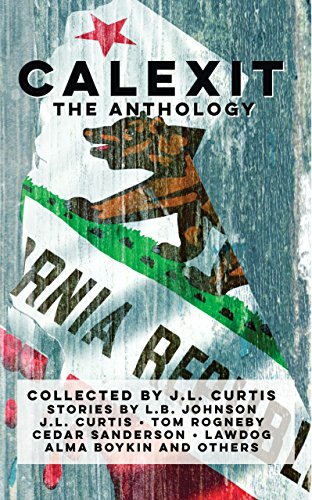 This laissez-faire attitude changed in 1968 when war reporter John Steinbeck IV (son of the well-known author) published an article describing the extent of the abuse of drugs among soldiers in Vietnam. 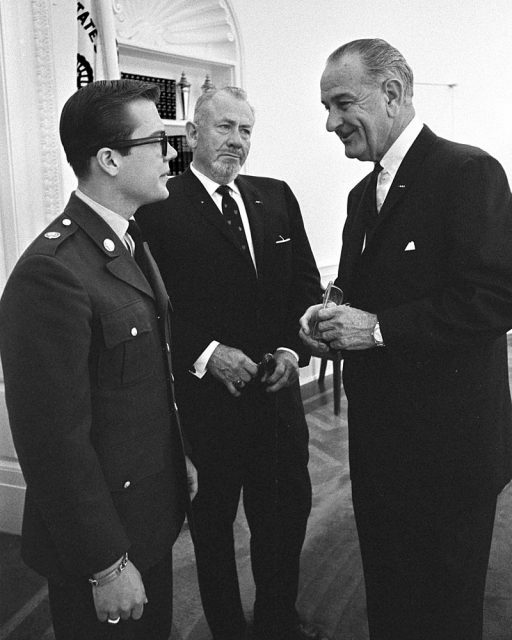 John Steinbeck at 19 (left) with father John (center) visiting President Lyndon B. Johnson in the Oval Office, May 16, 1966. The nation was shocked by his claim that 75% of the forces serving in Vietnam were regularly under the influence. Although this figure has since been disputed with claims that it was grossly exaggerated, the report created public outrage at the time. But of course, as America should have learned from the prohibition era, banning something can simply drive it underground, or worse. In this case, many soldiers turned to heroin which was also widely available. Because it was odorless, it was that much harder to detect than marijuana. Destroying enemy bunkers after assault on Hill 875, 2nd Bn., 173rd Abn. Bde., Vietnam, 1967. As well as illicit recreational drugs, it is known that prescription drugs were also taken by soldiers in Vietnam in large quantities. Prescribing levels among GIs in Vietnam were a major cause for concern with millions of tablets being prescribed to soldiers. The most common prescriptions were for amphetamines which were helpful in dealing with fatigue and increasing endurance. Many GIs were also prescribed sedatives to help them deal with anxiety and stress caused by the situations they faced daily. The impact of these drugs is hard to access. War creates such extreme circumstances that it is common for soldiers to behave in ways that are completely out of character. 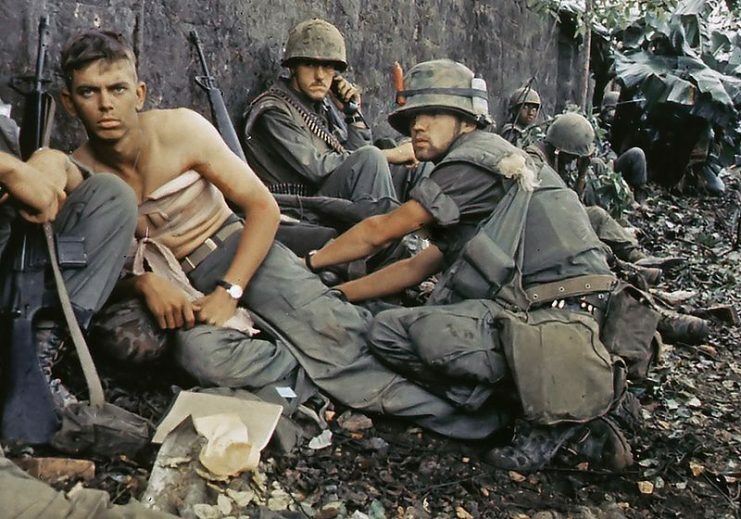 Some of the atrocities of the Vietnam War such as the My Lai Massacre need an explanation, and historians have suggested that drugs played a significant role. 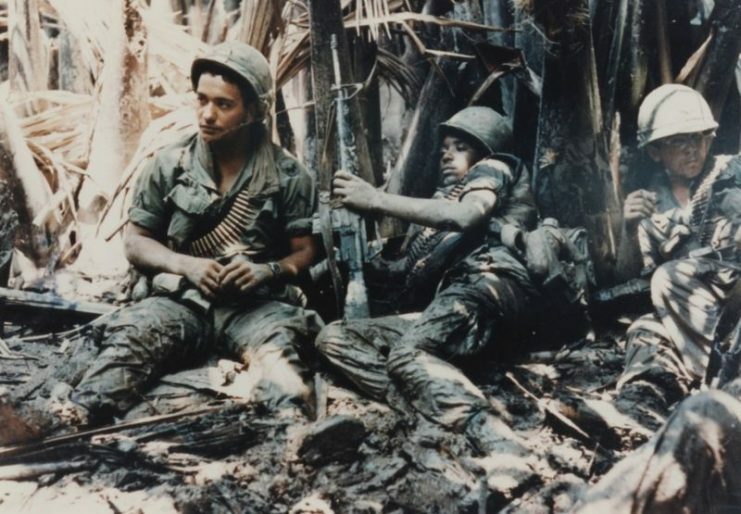 In his book Shooting Up: A Short History of Drugs and War, Lukasz Kamienski suggests that many of the atrocities carried out against the Vietnamese people were not due to hard drugs like cocaine and heroin but at least partly as a result of soldiers suffering from amphetamine withdrawal. The backdrop to all this was America in the 1960s. It was a time of major social change where drugs were also playing an increasingly large part in the music scene. The music of the period was heavily influenced by events in Vietnam both directly and indirectly. 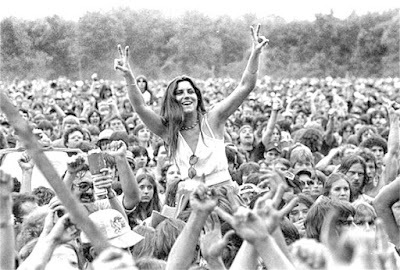 It is tragically ironic that in 1969, the year that peace and love were being celebrated at the first Woodstock festival, 11,000 soldiers were killed in the Vietnam War. The music that was popular at the time, including protest songs, spoke to the soldiers just as much as it did to others of their generation, After all, many of those who fought were reluctant young conscripts who would rather have been at home, getting on with the business of living their lives. Not surprisingly, many of the most popular tracks of the era alluded directly or indirectly to Vietnam. A classic of the time was Fortunate Son by Credence Clearwater Revival. The song was written in response to the marriage of Eisenhower’s grandson to Richard Nixon’s daughter. The song contains references to the war and became a major anti-war anthem. More broadly, it addresses the inequalities of society that resulted in a majority of the working class and young black men being sent to fight in Vietnam. Other popular songs included Otis Redding’s Sitting on the Dock of the Bay. Perhaps its popularity rested on it offering at least a mental escape from the pressure and stress of the conditions of war. The title of the 1965 hit by the Animals We Gotta Get out of this Place says it all and is enough to explain its popularity. As with other iconic songs of the era, it addresses universal hardships rather than the specifics of the situation of the soldiers in Vietnam. Whatever the true impact of drugs, the history of the Vietnam War will always be bound up with both the music and drug culture which were very much part of the prevailing mood in America at that time. The Douglass DC-3 flew under both the Axis and Allies forces. The Douglas Air Company’s iconic DC-3 airliner and its military counterpart, the C-47 Skytrain (more famously known as ‘Dakotas’) were built in enormous numbers, with a combined total production of around 16,000 airframes. The DC-3 entered service at the end of 1935 and the twin-engined metal-construction monoplane helped popularize and revolutionize passenger air travel, particularly in the US. The plane was cheaper and could fly faster and further than its contemporary aircraft, while it also offered greater comfort and passenger capacity. 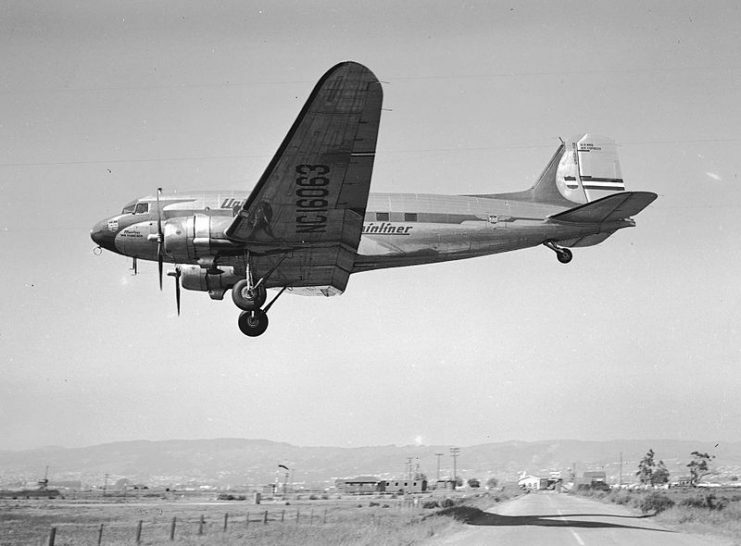 Douglas DC-3A Landing at Oakland Airport in 1940. The L2D2 ‘Tabby’ was the Japanese license-built version of the DC-3. The Boeing 247D was the DC-3s direct competitor. 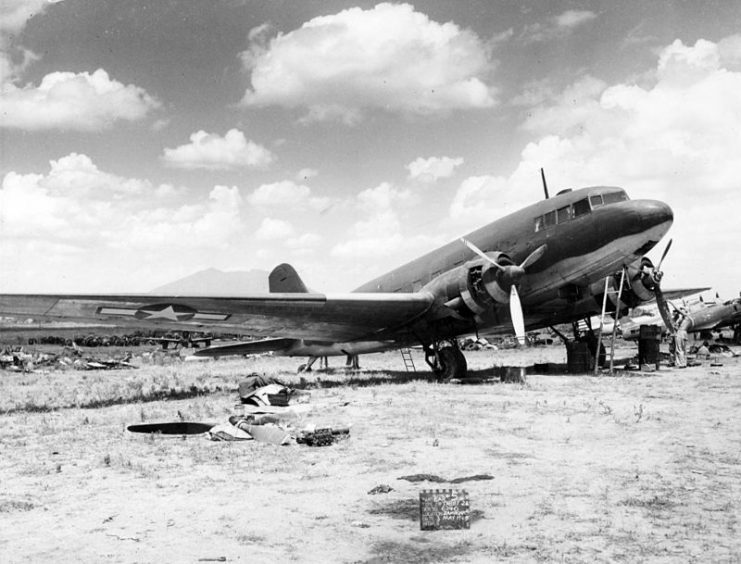 The 247D failed to take full advantage of entering production slightly ahead of the DC-3 and only 75 were made. The de Havilland Express was beautiful and chic, but it had an abysmal safety record. Many of the 62 planes that were built crashed due to its poor design and stability issues. 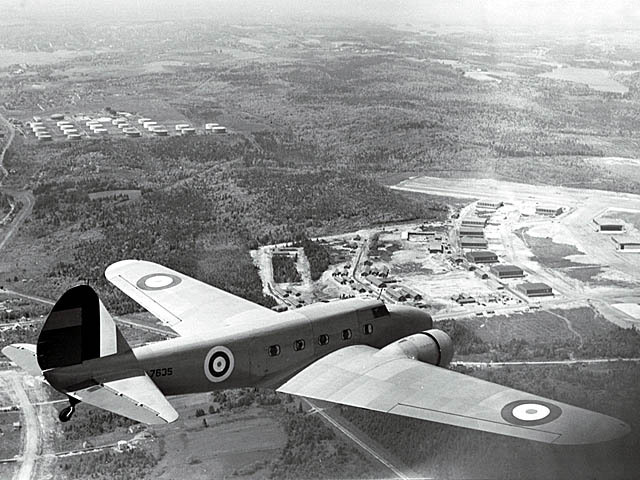 Royal Air Force De Havilland Dh 86, 1939-1945. 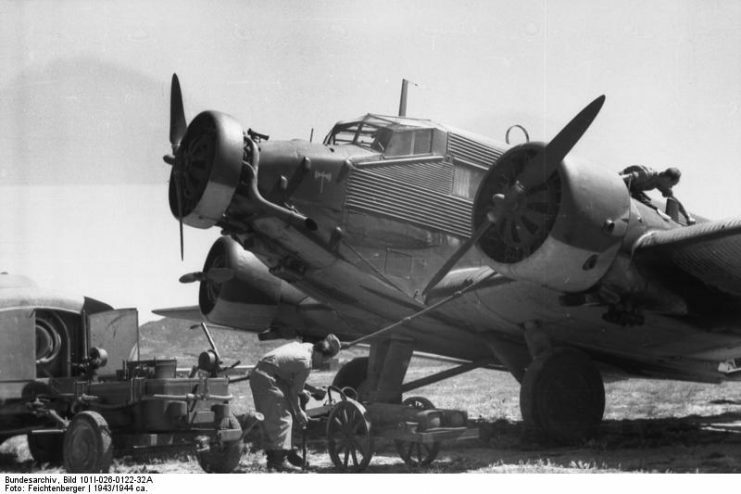 The Junkers 52 was produced in large numbers, with nearly 5,000 built. The aircraft entered service from its first flight in 1930 and a very limited number remain in service today. Only 55 S.73s were ever produced. Although a little underpowered, the aircraft proved to be extremely rugged and reliable. It, therefore, made a lot of sense to build a militarized version of the DC-3, which had a large cargo door, reinforced floor, and an Astrodome in the cabin roof. The C-47’s proved immensely popular and were used as cargo planes, troop carriers, as glider towing aircraft, among other roles. 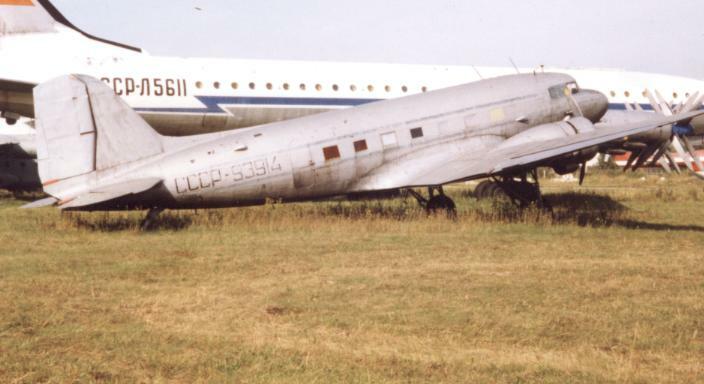 It may be surprising, but the DC-3 was also built under license in the USSR (Lisunov Li-2) and the Imperial Japanese Empire (L2D2). The Japanese acquired a production license in 1935 for the bargain price of $90,000, little more than the $80,000 cost of a single DC-3 at the time. The Japanese wasted no time getting production started on their own version of the DC-3. The Nakajima Aircraft Company teamed up with Showa Aircraft Industry, an aircraft manufacturer established in 1937 to produce military planes. Nakajima Aircraft Company had designed and constructed various types of military aircraft since the 1920’s for the Japanese Armed Forces. The company’s previous aircraft included reconnaissance planes, seaplanes, fighters, high-altitude interceptors, and naval torpedo bombers. Towards the end of the Second World War, the company designed a prototype jet aircraft (Kikka- Orange Blossom) and began mass production of a suicide plane (Tsurugi- Sabre), although it was never deployed. Furthermore, the Nakajima Aircraft Company’s 14-cylinder air-cooled radial engine (Sakae– Prosperity) powered the legendary Mitsubishi A6M “Zero,” but it had little experience building passenger or cargo aircraft. Meanwhile, Showa Aircraft Company had no previous aircraft production experience, but the company had money to invest. Showa subsequently set up a strategic partnership with Nakajima in 1938 after it purchased the production license and tooling to construct DC-3 passenger liners. Nakajima and Showa set up aircraft production lines in 1939 and its version became known as L2D in Japanese service. The aircraft was later given the Allied code name ‘Tabby’. Japanese Army transport plane Showa L2D. The first aircraft were completed in 1940. 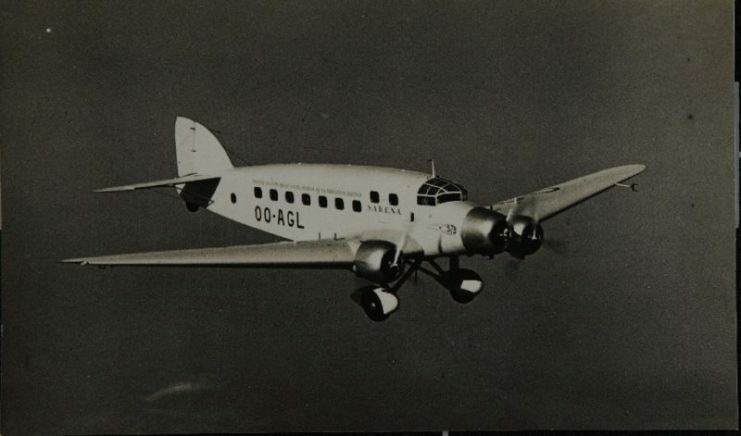 Two planes were initially produced with the designation L2D1, built with American-sourced components and engines and differed little from the original DC-3. Production using locally made components and engines then began in earnest, to be designated L2D2. In all, Nakajima produced 71 L2D2 transport models through to 1942. Nakajima then left the project to concentrate on manufacturing combat aircraft such as the Nakajima Ki-43 Hayabusa fighter, code name ‘Oscar’. A Japanese Nakajima Ki-43-II Hayabusa fighter. The Showa Aircraft Company went on to make 415 L2D2s before the end of the war. The vast majority of the aircraft were produced for military service, although a small number of commercial passenger planes versions were made. These were built for civil use by Imperial Japanese Airways, Japan’s national airline throughout the Second World War. The military version of the L2D was similar to the US C-47 Skytrain, with its large cargo door and reinforced floor. A noticeable difference between them was the cockpit cabin which was extended and had three windows added either side so that all four crew members could sit together at the front. Showa L2D in 1945 with Flying Tigers personnel. A handful of the later production models carried three machine guns, with an A13 mm machine gun in a dorsal turret and two lighter 7.7 mm machine guns that could be fired out of fuselage hatches. Nonetheless, it is unlikely this configuration was particularly effective since US B-17G bombers carried a total of 13 heavy machine guns to defend against enemy attacks. Near the end of the war, about 20 L2Ds were built with non-critical parts constructed from wood instead of metal due material shortages. There was even a plan to make a version (L2D5) that used wood wherever possible, but the war ended before completion of the project. By the end of the war, nearly 500 L2Ds had been constructed, making them Japan’s most numerous military transporter and accounting for around 3% of all the DC-3 and its derivatives built. No version of the L2D survives to today. Regarding its manufacturers, Nakajima underwent a number of changes and is now called the Subaru Corporation, a leading Asian car manufacturer. Meanwhile, after the war Showa diversified and established itself as an aircraft component manufacturer. Of Japan’s Axis allies, neither Fascist Italy nor Nazi Germany produced DC-3s. 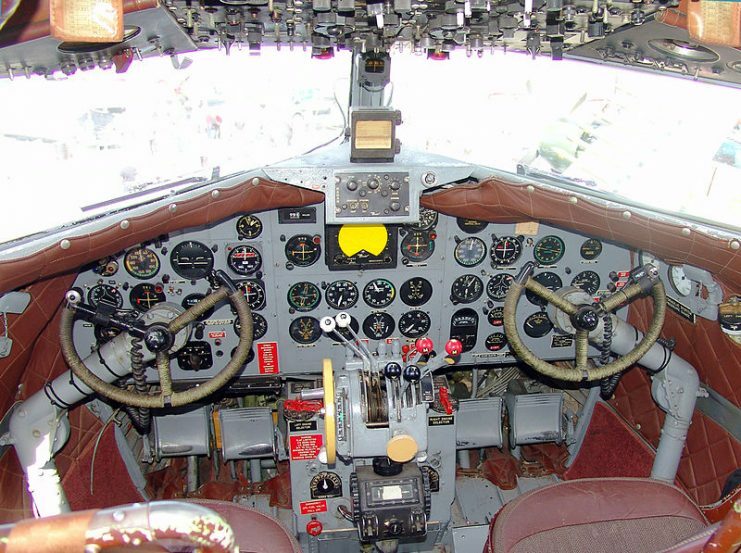 DC-3 cockpit. Photo: Intersofia CC BY-SA 2.5. 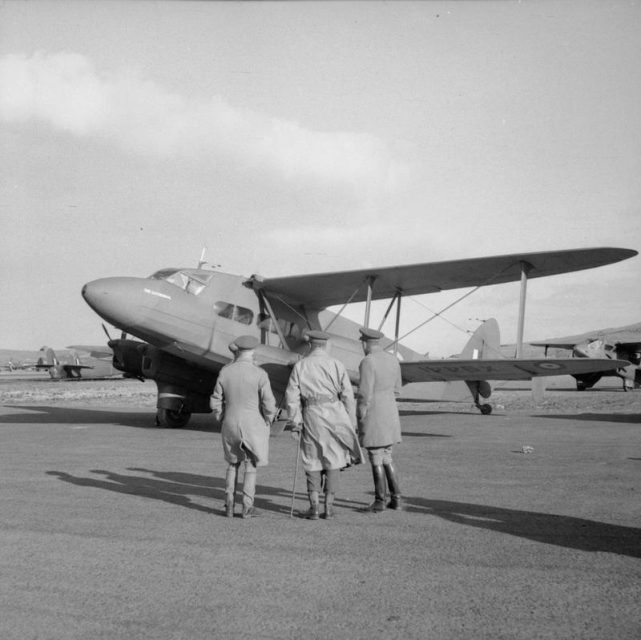 The Italians managed to acquire a single Belgian DC-3 in 1943 while fighting in Algeria, which was later handed over to the Germans. In addition, Germany managed to gain several at the beginning of the war. Germany captured four Czechoslovakian-owned DC-3s when it invaded, with the aircraft handed over to Lufthansa in 1939 for use on commercial routes. A further five DC-3s entered German hands after the Dutch surrendered in 1940. One of these was rumored to have been used for covert operations by III./KG 200, the German Special Operations Squadron.